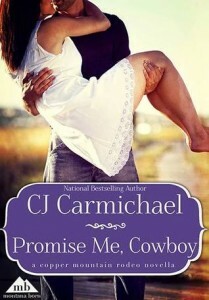 Review: Promise Me, Cowboy by CJ Carmichael + Giveaway – Escape Reality, Read Fiction! Sage Carrigan never meant to be the other woman. Unfortunately, bronco rider Dawson O’Dell neglected to mention he was married the night he invited her to his bed after they’d both placed first in their rodeo events. When his wife walked in on them – Sage was deeply hurt and humiliated. After an accident in the ring the next day, Sage decides she’s quitting the rodeo–and cowboys—to become a chocolatier in her hometown ranching community, Marietta, Montana. She’s doing just fine, but then Dawson shows up —five years later, with a little girl in tow. He’s here for the Copper Mountain Rodeo hoping to win big. But he’s also got plans of settling down with his daughter and buying a house—the very same one that Sage has been dreaming about. He says he’s here for her and he’s making lots of promises. But can he keep them? Chocolate is always a good starting point for a romance, but running a chocolate shop is hard work. Sage Carrigan has been running her own chocolate shop in Marietta, Montana for five long and pretty exhausting years. But they have also been rewarding years, because being a chocolatier is what she really wants to do. The barrel-riding accident that tore her ACL may have ended her rodeo career, but it gave her the out she needed to start the career she really wanted, instead of staying with the rodeo because it was the one thing she did that seemed to earn some praise from her taciturn father. She hasn’t gotten anything from him before or since except questions about when she’s going to give up her store and come back to the ranch, or why she let one little injury turn her into a coward. Sage is all too aware that four girls were not what her father wanted. It’s too bad that he let them all know just how much of a disappointment they all were. And into the middle of Sage’s life walks the other man who disappointed her, Dawson O’Dell. Dawson is a rodeo cowboy, and he’s in town for the Copper Mountain Rodeo. But that’s not all he’s there for. He’s finally come back for Sage. Because the last time he saw her, his wife was standing over both of them with a shotgun. Dawson forgot to tell Sage he was married. And that’s the one lie that she simply can’t get over. Not even if Dawson has come to Marietta to stay. Not even if Sage is forced to admit to herself that she still wants him. Because the stupid cowboy still isn’t divorced. Not yet. Escape Rating B: So far (I still have one to go) every single one of the stories in the Copper Mountain Rodeo series has been one sweet ride after another. They use the town and the annual rodeo setting just perfectly to capture the essence of being parts of one event, without repeating each other. Very well done. Promise Me, Cowboy is a “still waters run deep” kind of story. There’s not just the second-chance at romance story between Sage and Dawson, but the backstory about how the first chance was screwed up so badly and how much effort Dawson has put into redeeming himself. Also a lot about the secrets that children keep to protect their parents, and parents keep to protect their children. I’ll admit I thought the big secret was worse than it was. This story packs a delayed wallop. Sage takes a while to come around, and so she should! But there are lots of layers about parents and children, Sage and her father, Dawson and his mother, and how those relationships influence them in both good and bad directions. And little Savannah steals every scene she’s in! 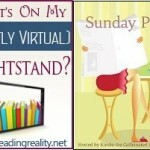 The author is giving away one ebook copy of Promise Me, Cowboy! To enter, use the Rafflecopter below. Any books by Jodie Thomas are among my favorites. My favorite Western romance is a movie, not a book. LOL! HIGH NOON. Right now, my favorite is Melissa Cutler’s cowboy series. I also love Lorelei James’ Rough Riders. Now that I think of it… I haven’t really read any contemporary western romance. Not that I don’t like them, just haven’t run across any that really caught my attention. But these sounds fantastic! Thanks for sharing!